ABOVE: A T1 tram from Mestre arrives at Piazzale Roma, the gateway to Venice's historic center. If you've arriving or departing by air or rail, we suggest staying closer to the Venezia Mestre railroad station and its ATVO Fly Bus stop. (See our listings for Mestre hotels and Marghera hotels near the station.) Still, for air travelers, there is another option: Take the Venice airport bus from Marco Polo airport to Venice's Piazzale Roma, then catch a T1 tram to your hotel. 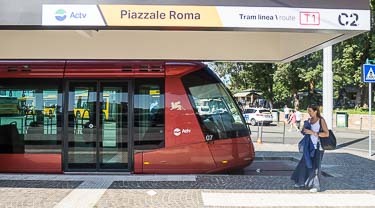 Most of the hotels on this page are along the eastern half of the T1 tram line (the red line between Mestre Centro (Piazzale Caldini) and Venezia Piazzale Roma) on this map. You may need to walk two or three blocks from your hotel to the nearest stop. When you've clicked through to a hotel page from the listings below, click the "Check location" mini-map below the search box to see the hotel's exact location. Modest travelers might be turned off by the glass-walled baths in some rooms, but others will appreciate this 85-room hotel's wide choice of room types (including mini-apartments). The full-service hotel offers free Wi-Fi, free parking, a well-equipped fitness room, and a bar-restaurant on the premises. Free parking and free Wi-Fi are standard at this hotel, which also has a bar and restaurant. Children under 8 stay free (if no extra bed is needed), and connecting double rooms are available. This 51-room hotel has a bland modern exterior, but if offers a number of appealing amenities, including a bar, free Internet access (both wired and Wi-Fi), and free parking. The San Carlo has 27 rooms, free parking, and free Wi-Fi. (Pets stay free, too.) A tram stop is close to the hotel, and you can buy tickets at the reception desk. This hotel has 14 rooms. Free Wi-Fi is available in the lobby, and you can park your car on the premises for a fee. The Viale San Marco and the T1 tram line are only a few blocks away. The Guidi is close to a T1 tram stop, and it's next to a small canal. The two-star hotel has 17 single, double, triple, and quad rooms with free Wi-Fi, and Booking.com's guest surveys have elicited praise for the friendly staff. Parking is available for a fee. This two-star hotel has 26 rooms, a patio where breakfast is served in good weather, and free Wi-Fi. Parking is available for a fee. The Giada is tiny--it has only three rooms--but a shared kitchen is available, and so is free parking.